Surprise Package (ENG) - Website of wildsidefishing! 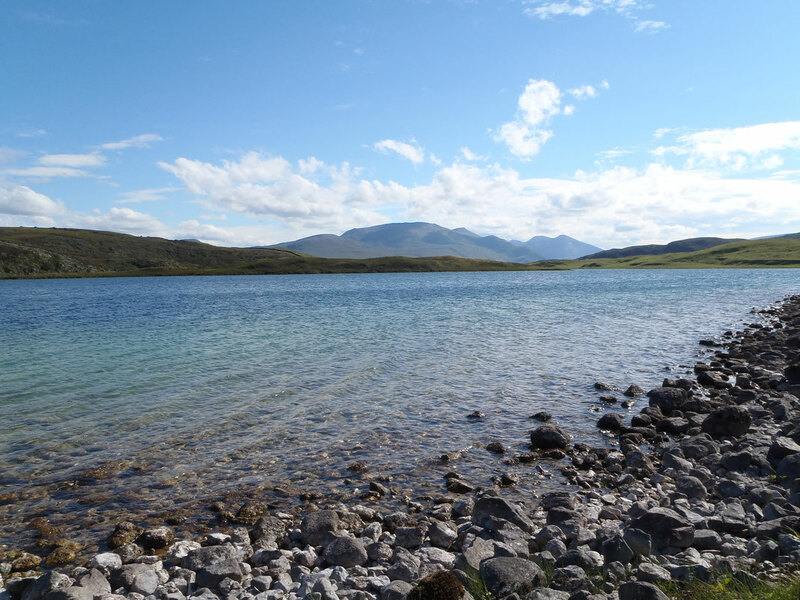 When you think of fishing in the Scottish highlands what do you imagine? Perhaps you close your eyes and see wild open moorlands surrounded by intimidating cloud wrapped mountains. Maybe you picture deep green valleys split up by cascading waterfalls with salmon leaping up them. Both hold truth in their descriptions but when I think of the highlands I always like to think of the unexpected. I can’t remember how many times I have been totally blown away by something that I didn’t expect when fishing there. Sometimes it has been fish from where I would have never expected them or a fly that has caught so well even when every other angling friend of mine has looked at me with suspicion and mumbled something about white coats when I have my back turned to them. I have been almost blown out of the boat when I should have stayed at home only to see clouds of mayflies whizzing by in mid July. 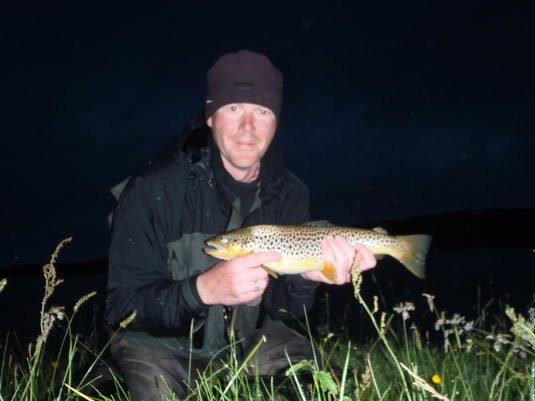 The single biggest surprise though for any prospective trout angler in the Scottish highlands is, in my opinion, the amazing trout fishing in the four limestone lochs that lie in the vicinity of the coastal village of Durness in the very north-west tip of Scotland. I will never forget the feeling that I got when I first peered out over the boat into the water and realised that it was the bottom I could see and not a trick of the light deceiving me. Every little detail of the weed beds and stones could be made out quite clearly without the dark, almost sinister nature of peaty water that I was used to. I had never dreamed of such clear water in a loch. The difference in the clarity of the water could be compared to standing a pint of Guinness beside a glass of spring water and playing spot the difference. Then there were the trout: jumping and head & tailing at their leisure, revealing colours that confounded my understanding of what a loch trout should look like. As far as I was concerned trout were dark brown, sometimes nearly black, with yellow and white bellies. The trout I was observing here didn’t fit into this category at all and made me even doubt their authenticity. I was seeing silver, almost white, trout with marbled sides. This is the same surprise that countless other trout anglers get when they first venture out onto these natural treasures. 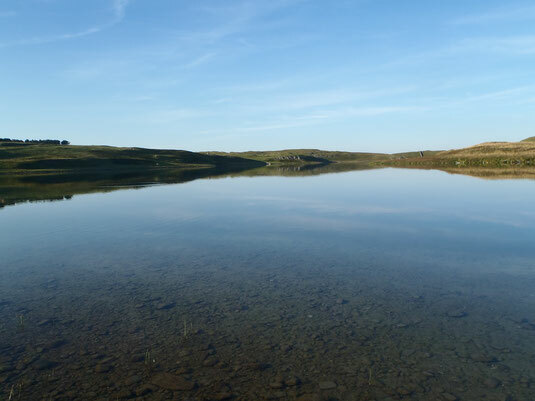 Fly fishing at these lochs with a level of success is not always easy and certainly more difficult than the dark hill lochs mentioned earlier. There are a number of factors to consider when approaching them for the first time. These trout are tackle shy in the extreme and the crystal clear water serves as a means for the trout to refuse, turn away and never look twice at your offering. The first point that I always focus on is not to over complicate matters in an effort to convince yourself that it is necessary to outwit the trout and as a result I’ve never made anything that I use in fishing (for any species of fish) over complicated. A 9ft to 10ft rod with a 5/6 weight rating should suffice and being old fashioned I usually stick to a floating line. Sink tips, intermediates and sinkers all have their place and should be used when the need arises. My leader is extremely simple and is made from 6lb co-polymer nylon straight to the line loop and usually is about twice the length of the rod. So with a 10 foot rod you are looking at a leader of about 20 feet long which should be long enough to help deceive the wariest of fish. Some may regard this as terribly old fashioned but it works for my guests and myself very nicely and if it aint broke then don’t fix it! Loch fishing in Scotland usually sees more than one fly on the leader (Bob, dropper and point/tail) and is usually referred to as “loch style fishing”. It’s a classical and traditional set up for boat or bank fishing and the main ingredient to get it working away nicely is wind: a flat calm is no use for this method. The bob works at the surface with the other two balancing the leader in the subsurface and the whole set up works on the principle that wild brown trout feed in a vertical rising manner, always looking upwards for their next easy meal. My personal preference regarding fly placement is a bob fly about five feet above the point and no middle dropper. I don’t like three flies on my cast for a number of reasons (my friends are talking about white coats again) but the main one for up here is the danger of the extra fly catching in weed when a fish is hooked leading to inevitable consequences and as these nutrient rich lochs have rich aquatic plant growth I feel this is a wise precaution to take. I also don’t vary the braking strength for the dropper or tippet. These trout fight hard and if your presentation is up to scratch then 6lb co-polymer is hardly going to be a factor in the trout declining to take and it gives you enough muscle when it is required. If the breeze dies and you are faced with a flat calm then I would remove the bob and opt for a single dry/surface imitation. Fished in the dead drift style on a degreased leader, these can be deadly. The other option when faced with a flat calm is to fish sinking or intermediate lines with wet flies or nymphs to avoid the surface noise from a floating line. In a decent breeze the classic wet loch patterns all do well with flies such as Kate Mclaren, Doobry, Grouse and Claret, Silver Invicta, Olive Bumble and Black Pennell patterns all being worth a try. In particular, I like using small bushy olive or hare’s ear Sedgehogs in the bob position as they have such a devastating pop up action that very few trout can resist. One fly that I have used to amazing effect as a point fly is called the orange crunch and it is simplicity in the making being no more than a hot orange body, gold rib and a trimmed down orange hackle tied on a size 14 grubber hook. Maybe it looks like a buzzer or a shrimp, I don’t know, but when the sun comes out the hot orange and gold really get the trout interested. Small hoppers and cdc buzzers such as palomino midges should suffice for dries and always make sure you have a few sedge imitations with you to slowly, and I mean slowly, drag over the surface. One very worthy note to make about retrieval of the flies is to keep it slow. I have always found that a slow retrieve works best in the limestone lochs. By slow I mean about five cm’s per second with irregular pauses every once in a while. I find this imparts a little bit more action to the flies without the speed of a traditional retrieve or the lack of movement associated with a figure of eight. The conditions to fish in are also of obvious importance. As most hill loch anglers will tell you, sunshine is not your best friend when it comes to catching wild trout. I adhere to this when up in the hills but in total contrast find that bright weather does little to dampen the fishing in the limestone lochs: If anything I prefer it. The wind is, in my opinion, the main weather factor to take into consideration as it is in any wild loch fishing situation. Being located in the very north of the country the wind can be rather “blowy” at times and although not to be compared with the winds of the Outer Hebrides it can become a waste of time when you can’t control either your rod or anything that gets hooked so keep your eye on the forecast if possible prior to fishing. Perfect conditions for me would be a light to medium force south-westerly with sunny intervals. Wouldn’t it be nice if we could pre-order the weather? We can book everything else for a days fishing but sadly we are always left merciless to the powers of Mother Nature. Incidentally, the main cause for concern when the wind drops is not spooking the fish and putting them down but the challenge of getting back to the car without losing a pint of blood to the resident midgies! Every angler wishing to fish in the highlands should be sure to equip themselves with a reliable insect repellent and a micromesh midge net. The limestone loch midges may not be present in numbers compared to the hill lochs but they can still make a grown man cry. You have been warned! The limestone lochs represent a true natural gem and one that Scotland can be rightly proud of. Visitors will find it hard not to take something away with them from their time at the water and they will offer any fly angler not only a true test of abilities but also (all things going well) an experience of a lifetime. So if you find yourself in the north west of Scotland, up in the hills catching wild trout remember that it is not only black water and dark trout that you can get lost with. 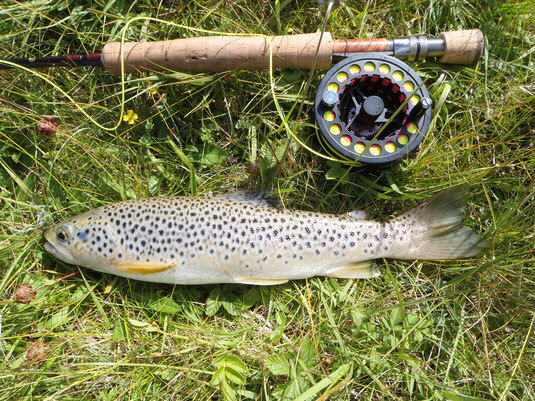 There are also four crystal clear paradises with wild trout that can open up a whole new addiction. I’m definitely an addict who’s not looking for a cure in any great hurry.